As if making sure you’re meeting your nutrient needs and giving yourself permission to eat what sounds good in recovery isn’t hard enough when you ARE feeling well, it can be super duper tough to do this when you are sick. I was inspired to write about this topic because I have been feeling under the weather for the majority of this week. Breakfast time on Monday came around and I was sick and feeling nauseous, but started pondering what wouldn’t make me feel more nauseous. I knew savory food would not agree with me, so I scanned my brain for what sweet foods I had available in the house. I remembered the brownies I had baked the day before. Brownies sounded palatable despite the nausea, so for breakfast I literally decided to have 2 brownies. Was it the most balanced breakfast on the planet that included all the macronutrient groups? No. Did it provide me with the necessary fuel to get through the first part of my morning? Yes, it did, and that's what took priority. Though I have been recovered from an eating disorder for 10 years, this week reminded me of how in my earlier stages of recovery, eating when I was feeling under the weather used to be SO very challenging. One of the things about eating when sick that can feel really daunting is that you may not be able to stomach the typical foods you enjoy. Yet, you know that it’s important to still provide your body with the nourishment it needs to fight off whatever funky situation is going on with your immune system. You may normally enjoy having chicken, pasta, and a side salad for dinner, but when you are sick this may not seem like something you can stomach. Personally, when I’m sick, I have a difficult time stomaching anything savory. So I opt for sweeter foods. This may or may not be the case for you. For many people, it's easier to stomach bland, starchy foods like a peanut butter and jelly sandwich or milk and cereal when they are sick. 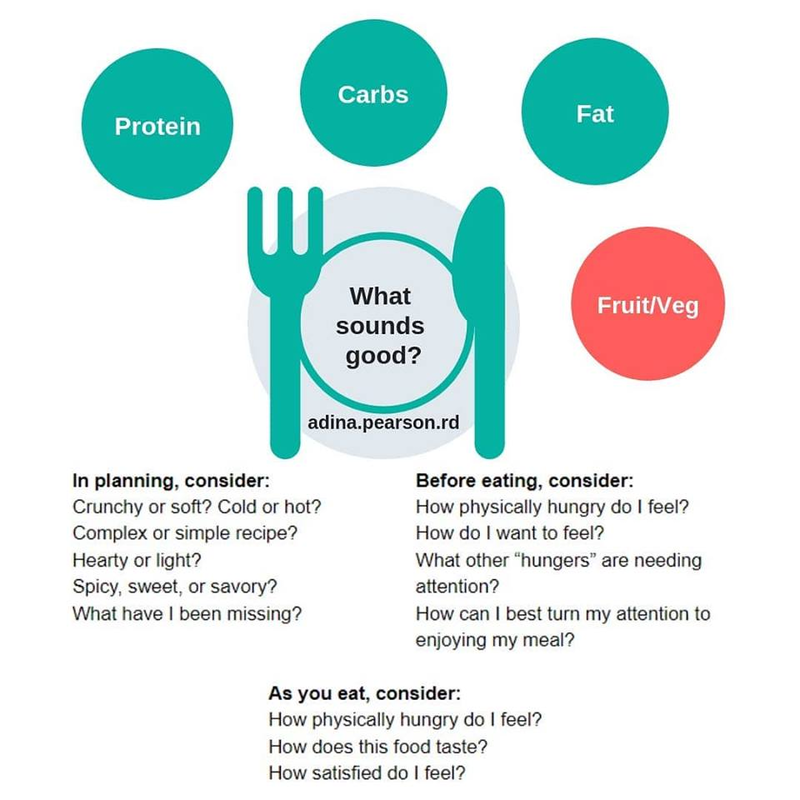 This may mean that for a few days you don’t have any veggies, and that’s ok.
One resource that might be helpful is using the bottom left section of this handy infographic created by Adina Pearson, RD to decide what seems the most palatable to you. When sick, focusing on the far bottom left section of considering if you feel most able to eat something that is crunchy or soft, hot or cold, or spicy, sweet or savory, can be a good starting point. You may not be able to fit in all the components of protein, carbs, fat, fruits, and veggies, but that is ok. You can always incorporate broccoli or brussels sprouts back into your meals when you are feeling better. Especially when sick, I find the intuitive eating principle of ‘Honor your Health’ to be particularly helpful (This principle is defined here by the authors of Intuitive Eating, Elyse Resch and Evelyn Tribole). Honoring your health includes knowing that regardless of the fact that your appetite may be nonexistent at the present time, you still need to eat, and your body still needs the nourishment. Your standard hunger and fullness cues might go out the window, but you can still do your best to honor your health by choosing to eat your meals and snacks as an act of self care. Once you have established that you need to eat your meals and snacks whether you are hungry or not, you can tune into your body to figure out which foods might be most likely to agree with you at any given time. In my case, this literally meant having brownies for breakfast.